The Managing Director of PMCA Economic Consulting – Dr. Pat McCloughan – is delighted to support the Ireland Funds, a worldwide organisation making a very valuable contribution to the lives of people throughout the island of Ireland. He attended the annual rugby luncheon hosted by the charity organisation at the Shelbourne Hotel on 3 February 2012 (see here for a report and pictures of last year’s event). 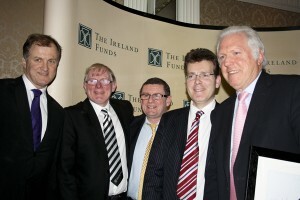 L-R: Hugo MacNeill, Chairman of the Ireland Funds and former Ireland rugby international; Ollie Campbell, former Ireland rugby international; Kevin Coghlan, MD of TierOne Prudential Limited; Dr. Pat McCloughan, MD PMCA; and Fergus Slattery, former Ireland rugby international and guest speaker.